Strategy games often come off as big, scary, serious, complex things, and A Druid’s Duel is hoping to make the genre both more interesting and a little less scary for newcomers. Blending elements of strategy with a focus on adaptation and change, A Druid’s Duel promises to be much more than just another in a long line of strategy clones. With a whimsical art style and game-changing transformative abilities, A Druid’s Duel attempts to set itself apart from what we know about the strategy genre. The game plays out much like chess, but with up to 4 players, things become much more interesting very quickly. Thrown in with the chess-like strategy is the ability to shapeshift your team of druids into a variety of different animals that all move, attack, and defend differently. Altering the landscape also plays an important part of the game, allowing you to move land and buildings on the fly. Weather will also play a role in gameplay, and in the storyline. A Druid’s Duel will have both single-player and multiplayer game modes, the former of which including a campaign and the latter being integrated with ranked league matches. A Druid’s Duel is currently under development by Kris Szafranski, and currently seeking funding on Kickstarter and a Greenlight on Steam, so check out the Kickstarter page for more information. 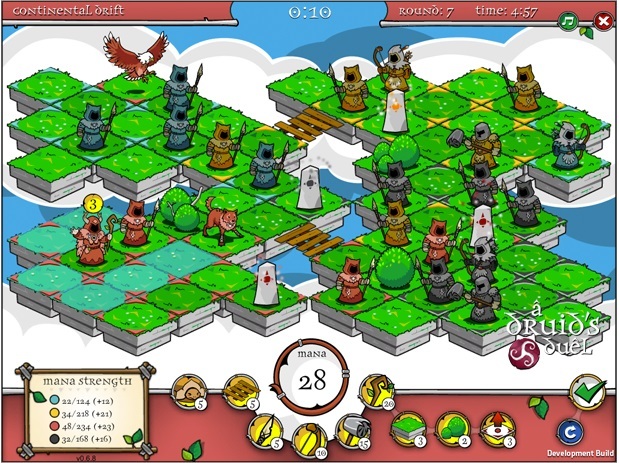 There’s also a free downloadable demo that can be found at druidsduel.com if you’re on the fence. Backers can expect early access, artwork, and game personalization at higher tiers. Nathaniel Liles is a freelance writer, writing major, and indie musician based in Southern Indiana. While procrastinating or avoiding real-world responsibility, Nathaniel enjoys playing rhythm games, action RPGs, and very colorful games with many bright, flashing lights. You can listen to Nathaniel sing songs or download his music for free at http://nathanielliles.bandcamp.com/.